An image of the Tenzing Montes peaks on Pluto created with New Horizons data and released on July 10, 2018. The mountains range from about 1.8 miles to 3.7 miles (3 to 6 kilometers) above the dwarf planet's surface. "This was one of the most complex yet most exciting planetary mapping projects I've had the pleasure to be involved with," Paul Schenk, a planetary geologist at Universities Space Research Association's Lunar and Planetary Institute in Texas, said in a statement. "Every time new images came down, something new would be revealed." The mapping project shows off the dramatic topography of both bodies and offers more accurate measurements of some of their most stunning features. For example, the research has confirmed that the Tenzing Montes are the highest peaks on Pluto, boasting heights up to 3.7 miles (6 kilometers) above the nearby surface. That's the equivalent of Alaska's Denali mountain here on Earth, according to the team. 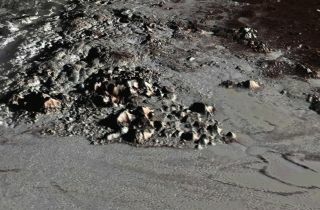 It's also high enough that the scientists are more confident than ever that Pluto's surface is made of water ice — methane ice, for example, wouldn't be strong enough to hold up features that large. Elsewhere on Pluto, the team identified possible locations where volcanic activity has shaped the dwarf planet's surface as well as a deep gash running more than 1,800 miles (3,000 km) around it, which scientists think shows the dwarf planet somehow extensively fractured earlier in its life. The map of Charon shows an even more dramatic range of features, with even higher peaks countered by an abyss deeper than the lowest point on Earth. A view of the surface of Charon released on July 11, 2018, uses data from the New Horizons spacecraft to show mountains on the left and a smoothed volcanic plain on the right. Because the process took advantage of the sun illuminating the harsh terrain, scientists have only been able to piece together the surfaces of Pluto and Charon that New Horizons flew over during their daytime — about 78 percent of Pluto and 45 percent of Charon. That means both bodies are still hiding some secrets for their next robotic visitors, according to New Horizons principal investigator Alan Stern, a planetary scientist at the Southwest Research Institute in Texas. "I can’t wait to see the other side of Pluto revealed in detail by a future mission to orbit the planet," Stern said in the statement. The new work was detailed June 11 and July 3 in a pair of articles published in the journal Icarus.